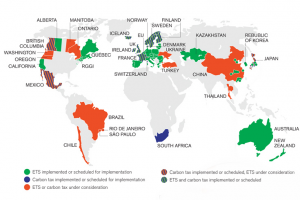 The World Bank’s just released its report State & trends of carbon pricing. Thirty nine countries and 23 sub-national jurisdictions (eg, regions or states) have or are planning to introduce carbon pricing schemes, such as carbon trading schemes or taxes. The European Union has the largest carbon market, followed by China. The report notes that the pricing market is “two steps forward, one step back”, as some countries are introducing schemes while others are pulling out of their mechanisms (Australia) or are pulling out of the second commitment round of the Kyoto Protocol (NZ, Russia & Japan). The report is optimistic in the sense that it sees carbon markets as here to stay. It emphasises the diversity of approaches to carbon pricing, and how innovation in established schemes is still going on. On the other hand, the schemes are only a start and don’t have significant impact on reducing global green house emissions at this stage. It advocates for international cooperation to better link national or regional schemes, as well as for other big greenhouse gas emitters to start schemes. A robust global solution and greater use of carbon pricing could strengthen private sector confidence to invest in low-carbon solutions and technology. A short readable summary of carbon pricing schemes, including an animated map can be found at Sightline. They also show who they call the top 20 carbon polluters, noting the mis-match between some of the main sources of greenhouse gas emissions and absence (or small size) of pricing schemes. The World Resources Institute have also produced an interactive map showing changing greenhouse gas emissions since 1850. Germanwatch has released their 2014 Climate Change Performance Index. New Zealand comes in at 42, just ahead of the US. On a more positive note the World Resources Institute has also released a report indicating how the US could both cut greenhouse gas emissions and increase economic performance. That probably won’t sway those opposed to the view that we are influencing climate. On the edges of the “Climate change debate” there are attempts by some, such as US law professor Dan Kahan, to better understand people’s and groups world views so that constructive discussions about the issues can be had and agreement on solutions to reduce emissions, or to plan for adaptations, can be reached. It’s not easy, quick, nor always successful. Data is good, but by itself it won’t be enough to change entrenched views. There are signs to be optimistic that steps are underway to reduce greenhouse gas emissions, but the current scale and pace of change are far from sufficient to substantially reduce emissions over the medium term.